Employers spend large sums of time and money on improving business systems to get employees producing faster and better results. Yet shockingly little is done to examine the basic reason many employees fail to have the essential energy, concentration and productivity they need to excel on the job. Nutrition continues to be one of the single most important, yet undervalued, simple aspects of workplace productivity. Surprisingly, an overwhelmingly large number of corporate wellness programs focus on fitness and barely touch on nutrition education or offering healthy food choices at work. 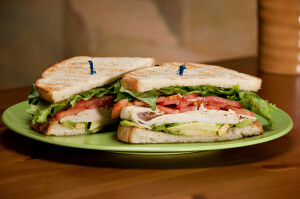 It is no surprise that lunch plays an immediate and significant role on how employees feel. A healthy lunch best for sustained energy includes three things (grains or starches, vegetables and/or fruit as well as a good source of protein). Overeating or having a heavy undesirable lunch leads to feelings of fatigue, sleepiness and disengagement. If lunch is skipped altogether, unbalanced or is too low in carbohydrates the brain does not have the raw materials needed for higher level thinking and problem solving. In addition to poor cognitive functioning, underfed employees may not play as nice with others on the team (after all an undernourished brain is anxious, depressed and likely to experience big emotional swings). A company that eats together, stays together. Forward thinking companies think of their team as one big family and understand that good things happen when food is shared. There is extensive research to support that families that eat together have better nutrition, reduced obesity, lower drug and alcohol abuse and have improved family connectedness. Eating together has the potential to improve workplace culture, boost morale and build new relationships. I would also argue that more deals have closed at corporate lunches than in formal boardrooms. Inviting prospects or clients for a healthy lunch with your team at the office offers a unique way to showcase your business and company culture that values employee health. It is also more productive than leaving the office and ensures you are offering healthy options conducive to a productive afternoon. Change is incredibly hard partly because we follow the path of least resistance and since we eat for so many reasons (such as stress, environment, emotions and social setting to name a few). Offering one nutrition seminar per year is guaranteed to make little impact on employee wellness. Build an ongoing, long-term nutrition strategy as part of your corporate wellness program. Enlist the help of registered dietitians to help ensure your company nutrition education is credible and effective. Regular employee nutrition education can be delivered by nutrition seminars, on-site nutrition counselling as well as online resources and video education. Ensure your company benefit programs cover the services of a registered dietitian. Ensure catered lunches and snacks brought on-site walk the talk for wellness. Often those in charge of ordering catered lunches haven’t been empowered to think outside the usual things ordered and will welcome the prompting to seek out better-for-you options. If employees want to buy pop, heavy meals and rich desserts, let them do so on their own budget. A healthy catered lunch doesn’t just include salad, it needs to incorporate hearty whole grains and filling protein rich choices. 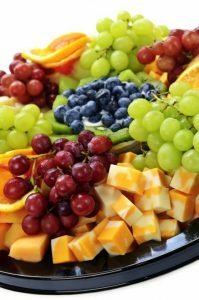 Find a few of the health leaders in your organization that can form a committee with the assistance of a registered dietitian to come up with an approved healthy catering menu with local vendors. Try a build your own salad bar, stir-fry theme or hearty soups, veggie trays and whole grain legume salads. Post weekly healthy recipes, lunch packing tips or meal ideas in your company intranet, newsletters and signage in your workplace eating areas. Create a healthy lunch challenge for your employees or departments. Have them submit photos of their healthy lunch along with a description. Offer incentives such as grocery store gift certificates or extra dollars for their health spending accounts for the highest number of incentives. Have a quarterly or monthly healthy potluck lunch to encourage sharing of new ideas, ethnic diversity and connecting as a team. Potlucks can be diverse or have themes like salad, crock pot or bento box. In addition to the above strategies, ensure that your company provides a proper allocated lunch. This may seem obvious but there are a large number of people that either don’t take a proper lunch or decide to eat it at their desk. The time off to enjoy a healthy lunch away from your workstation is vital so you can come back refreshed and ready to focus again all afternoon. How Can Virtual Dietitians Help Employee Health?